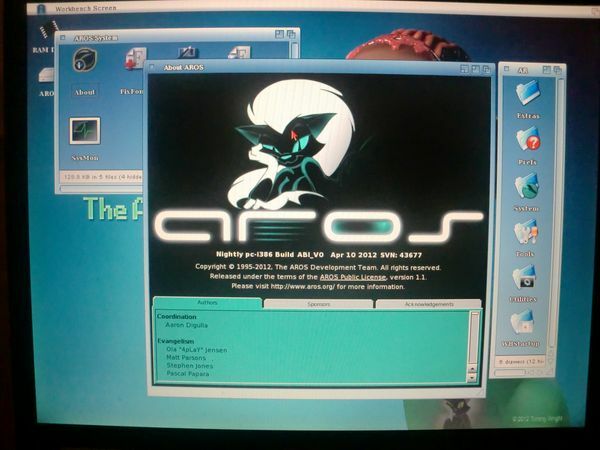 I’ve finally installed AROS on my old Toshiba laptop! 🙂 Hurrah! I’m happy that I got it working without any serious problems and I’m now in the process of exploring this new (for me) OS. First I downloaded a distribution of AspireOS which can be found here. There are other distributions available, but I chose this one due to the file size and the eye-candy. Unpacked the .ZIP archive to my hard drive and then burned the ISO to a CD. Since I wanted to have the option of running Windows XP as well (my laptop has that OS installed), I had to make some space for AROS. I therefore used a program to shrink the size of my D: partition. The result was that I got some unallocated space, while preserving both my C: and D: partition. I put the AROS CD into the CD-ROM drive and rebooted the computer. During startup, I pressed F12 and chose to boot with the CD-ROM drive. AROS loaded as it should and I double-clicked on the install-icon. There I got the option to select “use empty space” and did exactly that. The beauty of it is that the installer automatically installs AROS to the unallocated space on the hard drive. When the script finished, I had to reboot the computer and run AROS from the CD. I then continued with the install and after a few minutes the process was complete. Turned off the computer and switched it on again, removing the CD from the drive. A multiboot menu appeared on-screen and I selected AROS. It didn’t take long before the OS filled the screen in all its glory. Rebooted again and chose Windows XP this time, just to make sure that I hadn’t damaged it after installing AROS. Fortunately, everything worked like it used to. I must say that AROS feels kind of familiar to me already, since it resembles the old AmigaOS that I’m running on my Amiga 1200. I don’t think it will take too long to get to grips with. 🙂 I’m now looking forward to explore it during the weekend and if I like it enough, I might invest in some dedicated hardware for it. It so happens that I’ve got a mini-ITX case here with a hard-drive, CD/DVD-drive and a RAM-chip, but no motherboard. I know that the old Intel ATOM ones should be more or less fully compatible with AROS (I’m then thinking of the one used by ClusterUK in his Imica build – check it out here), so I could probably score one cheaply off e-Bay. Time will show what I’ll do. 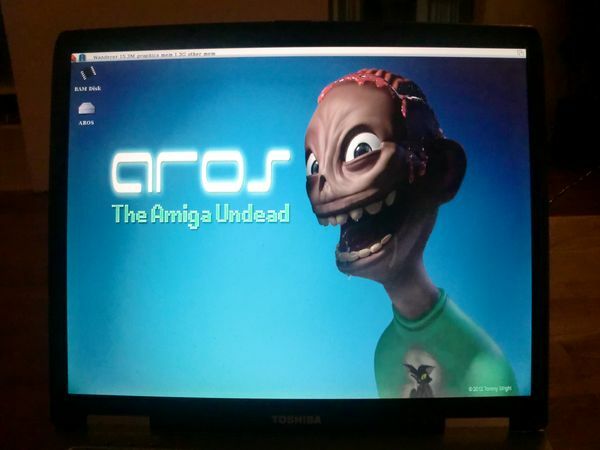 I’m hungry for a next-generation Amiga system and AROS seems like the best choice right now, since I can’t afford any of the AmigaOS 4.x options. The AspireOS distribution comes bundled with everything from emulators like ZSNES and DosBox to games like Giana’s Return, Quake and Rise of the Triad. It also includes a setup that lets you run classic Amiga software with ease. When configured, you can simply double-click on an .ADF file and the game will run directly. 🙂 I haven’t tried it yet, but I guess it would feel the way running a WHD-Load game on an Amiga 1200 would do (I know you can’t beat the real thing though.. Hehe.. ;)). I’ll keep you posted on my journey through the world of AROS. Anyone else going to try AROS in the near future or maybe you’re using it already? Would love to hear from you. I’m especially interested in your hardware configurations, as it might help me out later if I decide to buy a motherboard. I used Icaros but I might try AspireOS. How did you like Icaros? Do you know if Icaros supports more hardware options than other distributions? I only briefly worked with it. Nothing major. How’s AspireOS working for you? Sounds good. 🙂 Hopefully we’ll see the netbook demoed at Amiwest. Do you know if there is a list of fully compatible motherboards for AROS? Thanks in advance. If I had a spare laptop or a good enough tower I would give this OS a shot. It’s definitely worth it if you get hold of some cheap hardware. It’s a fun OS to use. It boots really quick as well.. takes just a few seconds! I’ll try to write a bit more about it this summer. Oh yes, that would be great if you did that! Please keep me posted. AROS has certainly come a long way during the last two years. Getting better and better! I’m going to get a new motherboard for my mini-ITX case, that’s for sure. AROS is a cheap way to get a decent next-gen Amiga system. I’ve just installed Ikaros, but as a qemu vm on Linux Mint (sounds like a multiculti, doesn’t it?). Works like a charm. I couldn’t make the network working so far, but this is a qemu issue (or rather my inability to make it working), not Aros/Ikaros fault. The system itself is charming. It is really impressive how much effort these guys put into it. Respect. Next step will be to install it on a real hardware, as you did. My old Thinkpad T60 veteran is waiting 🙂 But as for now, the qemu incarnation is doing ok.
Congratulation on installing the Icaros distribution. 🙂 It’s good to hear that it is working well. Looking forward to hear/read more about it. Are you going to post something about it on your blog? I’m searching for a fully compatible mini-ITX board now. Hopefully something will pop up soon. I hope I’ll find some time (read: re-prioritize things;) to write about this. First though, I have to close the “A1200 resurrection” story. Found on Vesalia: “AresOne – Apple did, why shouldn’t we?”. Hell yeah! Could be a right direction. Having limited team of developers, with rather minimalistic budget, targeting limited range of hardware is wise approach.